The WidthScribe promotional video I recently completed for Astute Graphics involved the actress driving a car – except we ended up casting an actress who can’t drive. We got around this in a few different ways, including the obvious substitution of a qualified driver in the wide shots, complete with appropriate wig. Perhaps the most interesting technique we used, and one which I might well have used even if she could drive, was Poor Man’s Process. Nowadays, most fake driving shots in films and TV shows are achieved by shooting against a greenscreen and replacing that screen in post with a moving background plate. A more traditional technique is to film against a rear projection screen – a screen onto which previously-shot footage of a moving background is projected in real time behind the actors. This was known as Process Photography. Poor Man’s Process leaves out the screen altogether, shooting against a plain, ambiguous background that doesn’t reveal the lack of movement – typically empty sky. Careful use of camera movement and dynamic lighting create the illusion of movement. Here is the set-up we used on the WidthScribe promo. The car is parked on Nick’s drive, which is conveniently sloped so that – from the camera’s point of view – only sky and a bit of a distant tree are visible in the background. A light behind the car represents the sun, and Nick chops a piece of cardboard up and down in front of it to represent the shadows of passing trees. Sophie operates a hairdryer to blow Laura’s hair around. Col shines a reporter light into the lens, moving it around to create the impression of the sun changing position relative to the camera. And I dolly the camera side-to-side while vibrating it ever so slightly. 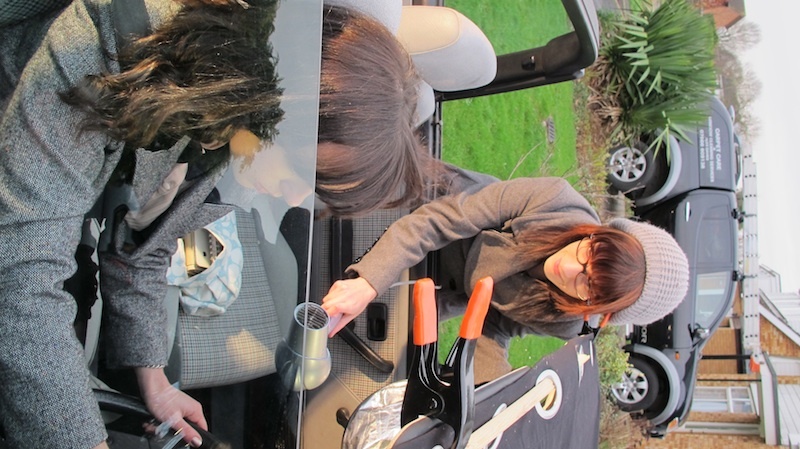 The drapes are to cut out the reflections in the windscreen. Poor Man’s Process works best at night, but with the shallow depth of field provided by DSLRs it’s now possible to get away with it in daylight too, so long as the shot is kept fairly tight and the road you’re meant to be driving on is fairly open. You’ll want to vary the lighting effects you use according to the surroundings the car is supposed to be in. 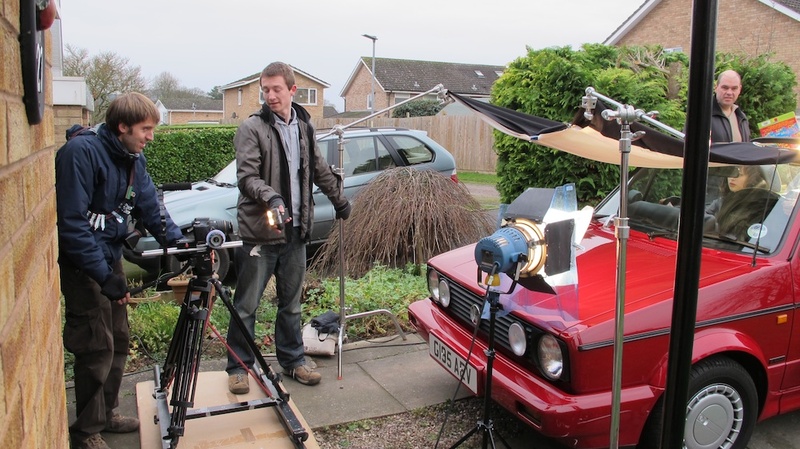 You can use spinning mirrors to sweep “headlights” or “streetlights” over your actors, or move a keylight representing the sun or moon slowly side-to-side, or even place two out-of-focus bulbs in the background of your shot to represent another car behind. I’ll leave you with an example of Poor Man’s Process in use on a big-budget Hollywood film, Michael Bay’s 1997 Alcatraz actioner, The Rock. All the close-ups in the cars were shot static in a car park.